As hard as it is for a grown man of 35 years to sit in front of a big HDTV wearing a communication headset attached to a plastic control device, any feelings of mild humiliation are tempered when immersed in a fierce online virtual gunfight with friends. Every gamer knows that feeling of anticipation; staring, unblinking, at the screen, waiting for the moment a deftly executed sprint-and- stab combination yields instance death to an enemy delivered by a careful flick of a few buttons and bumpers on a controller. Admittedly there is a sheepish feeling that descends once ones girlfriend walks into the room to determine why the aforementioned adult has yelped with glee, loudly enough for the neighbors to hear. That sense of anticipation took on a greater sense this week as Microsoft, purveyors of the remarkably fine and popular Xbox video game system, announced Project Natal the ‘insert PR person’s claim that its the “next evolution” of gaming…’ By the popularity indicators of today the new concept is capturing the online communities imagination as “Project Natal” ranked highly as a search term on Google, as a topic of conversation on Twitter and spawned many videos on YouTube. It appears that what Microsoft is proposing is stripping away the controller and headset from where grown adults hide, and replacing it with nothing. That’s right “nothing.” Project Natal is supposed to leap forward a generation beyond Nintendo’s motion-sensing controllers that allowed anyone to participate in virtual bowling, boxing, dancing, prancing, swaying, heading, yoga-ing exercise routine, by introducing gaming without a device in hand. Tangible-intangible gaming if you will. No longer will mature gamers be able to pointlessly dodge and weave to simulate their immersion in the action, to confirm they are unable to interact with ones partner about the choices for dinner or deny being responsible for household chores because of the plastic control device in their hands. 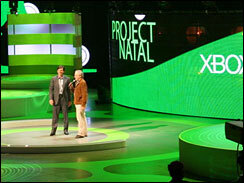 Project Natal was introduced at E3, the electronic entertainment expo, by Steven Speilberg representing the pensioner demographic, where herds of the curious imagined miming activity that would be relayed by motion-sensing cameras through a video game system to a monitor where movements will be translated into real-life ‘virtual’ activity. The concept appears feasible and engaging. Look how easy and accessible Nintendo’s Wii has made gaming for grandparents. Only this morning NBC’s Today Show ran a segment featuring a retirement community of octogenarian boxers and 298-bowlers. However Project Natal poses many questions for me which I probably won’t be able to answer until my grandparents or parents buy the system. Will Project Natal signal the end of a generation of overweight, pale children that evolve over-developed ‘virtual gaming’ muscles? Will people become more healthy because they are miming participation in activity rather than guiding onscreen characters to take part through operation of controllers by fingers and thumbs? What will happen to the “Xbox finger” support group? How will the motion-sensor compensate for overally expressive Europe nationalities that tend to communicate with a great deal of arm flailing? How much embarrassment will the new system’s auto detection of participants gender cause for long haired gamers? And does Project Natal contribute to Microsoft’s second coming? You might be able to find guidance on Bing.com. Writing these reactions to the future of a pastime my friends and I have bonded over for years, has helped me realize that it might, “might,” be time to grow up and become a functioning adult, retire my controller, controllers actually, including the Guitar Hero Gibson Les Paul replica… Perhaps I could particpate in actual golfing, bowling, drinking and watching football. Or perhaps I could stand in the warm, dry comfort of my living room, not having to wait for the hackers in the group in front, as I swing my arms and turn my hips before watching my seven iron approach to the green come to rest within gimme distance as I take part in my “regular healthy exercise.” Will I need a gym or golf club membership? I’ll never need to leave home. With the money saved I could by sunlamps to compensate for not ever being outside. Waiting for tee-times, an open lane at bowling will be a thing of the past as I mime my freetime away. The virtual future is here and Marcel Marceau missed his true calling by merely months, god rest his face-painted soul.